Frustrated, tired, weak, and empty—I locked eyes on an ultra-white ceiling tile like it was a face I'd known my whole life. It was one of the only views afforded me from the hospital bed. I spoke out-loud in a rasp, "OK God, I'll do this. But you have to promise me that when I'm here, like this, on my back, that you'll teach me something." I waited a very long minute. Deep breath. "I'll do this. I know you'll be with me. Just make it all worth something." Peace came over me—one that was enough to override the tubes and IVs, the beeps and the clicks, the pain and the fear. None of it went away, it just had a purpose now. That was May 2001. It was my first hospitalization after my Crohn's Disease diagnosis. And God has kept up one side of that deal, even though it was never God's berit. In puzzling grace, God accepted my challenge. So I've spent some days flat on my back—many in hospital beds suffering from chronic illness; others from serving the church in a raw, post-Christian reality that changes every day; often from attempting to disciple young people from behind an institution that's not a priority anymore; some even from trying to be a husband, father, and friend. But God's always been faithful to teach me something from there—from last place. That's where the essays of Leading From Last Place comes from. It certainly doesn't mean that I've mastered any of these lessons; rather, maybe it's time to open up and share some of them. They're little reminders that our position doesn't determine our influence. I hope they encourage those who feel like they're losing. And I hope they always point us to the original Last Place Leader (Phil. 2:5-11). 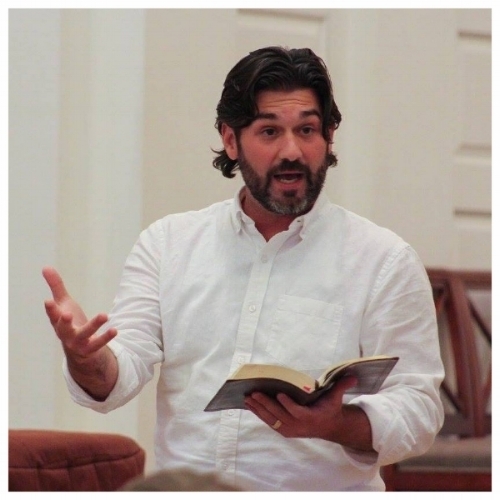 Bart Patton serves as Director of Youth & Young Adult Ministry Education at Perkins School of Theology, Southern Methodist University in Dallas, Texas. He has served the church as a preacher, teacher, youth minister, worship leader, writer, and pastor in Texas, Arkansas, and New York for the past 20 years. He is most passionate about teaching, preaching, and writing to resource the local church. Bart was born and raised in Searcy, Arkansas, where the Ozark mountains give way to the Mississippi Delta. He learned how to fish on the Little Red, play harmonica on the curbs of Beale, and tell stories on the lap of his great-grandfather, Richard Harley Bartlett. He is most blessed by those who journey with him—his wife Jenny, kids Will and Becca, dog Apple, and Will's hedgehog, Cespedes. He collects Pez dispensers, foam fingers, vintage Hebrew grammars, cow figurines, and Batman comics. A baseball field anywhere is Bart's happy place. Let's Go Mets! This is a personal weblog. The thoughts expressed here represent my own and not those of my employer.